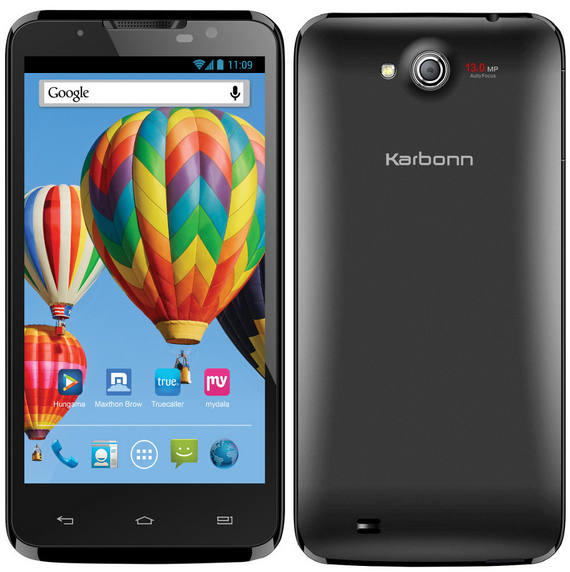 Last week Karbonn Titanium X with MT6589T was listed online and now a Full HD phone from Karbonn, Karbonn Titanium S7 is available for pre-order from online retailer Flipkart. The phone checks all boxes as far as per standard specs for MT6589T Full HD we have seen and has an attractive price tag of Rs. 14,999. The 5 inch Full HD 1080p display will give you great pixel density of 441 ppi as we have seen on all other Full HD devices like Micromax Canvas Turbo, Zen Ultrafone Amaze and Intex Aqua i7. The Processor used is MT6589T quad core processor clocked at 1.5 GHz and assisted by PowerVR SGX 544 MP GPU clocked at 357 MHz. The RAM capacity backing up this chipset has not been specified as of yet, but considering the price range it will most likely be 1 GB. The internal storage is 16 GB and can be extended to 32 GB using MicroSD card slot. The primary camera is of 13 MP and enjoys LED flash support for low light photography. The front camera is of 2 MP and the usual fixed focus camera of 5 MP won’t be missed much. The battery capacity has also not been specified. On the software front this phone comes with Android 4.2 Jelly bean operating system. We have seen various Full HD devices with MT6589T chipset and what makes this device stand apart from the others is the price. The phone can’t be expected to be ideal for gamers but will provide you with a Full HD experience at a competitive price range. At this price range this phone will compete against phones like Micromax Canvas Magnus and Zen Ultrafone Amaze FHD. hi can you please tell me why you said it is not good for the gamers because turbo is more powerful then MT6589. As the HD resolution of 1920 x 1080 the Turbo processor does not perform well as per our tests till now. This stylishly looking Karbonn smartphone shines in the market with it’s exquisite design and users friendly touch control options. It’s promising primary camera takes great photos and high definition videos with ease and the secondary camera delivers good video calling experience. It is a midrange phone and also boasts the name of cheapest among the midrange smartphone with many stunning features.